Fish finders are one of those necessary pieces of equipment for anglers that just makes any day of fishing the ultimate experience. The hard part is finding the best models out there when considering there are hundreds to choose from. All of the top names are represented including Furuno, Garmin, Humminbird, Lowrance and much more which is always a great place to start, but there are many others worth considering. When looking at the best of the best, we’ve done all the hard-work for you in creating our next fish finder review. While looking at everything an angler and consumer needs to know including price, performance, durability, extendibility, and real-life consumer reviews, we’re introducing the Top 10 Fish Finders in 2018 which is detailed in this in-depth review below. The Humminbird Hel9 Sonar GPS Fishfinder takes the top spot in this review, and rightfully so. This high-quality and affordable fish finder/chart plotter combo takes fishing to the next level and won’t break the bank getting you there. Coming in hundreds less than competitors while sporting an amazing 9-inch wide screen display which gives you a clear look under the boat. The Helix 9 fish finder scores a 5 out of 5 and garners a perfect 10 out of 10 from us as it offers a simple, intuitive control panel. Users of all experience levels can get on the water in class and allows for customization with 3 programmable buttons. Some of the highlight features include Switch Fire Sonar and Dual Beam Plus which helps separate it from other fishfinders/chartplotters in its price range. If you’re looking for something with a slightly larger display while still being affordable, the 2nd fish finder in this review is for you. The Helix 10 Sonar GPS Fishfinder scores an impressive 9.9 out of 10 and is highlighted by it’s gorgeous 10.1-inch TFT display. Outfitted with 3 programmable buttons which allows you to store your own presets making it easier to get what you want, when you want it. The Humminbird Helix 10 fish finder features upgradeable software which allows you to download the latest software upgrades. This keeps you entuned to modern technology and with Humminbird continually releasing upgrades this is the best way to keep up with the times. New maps, locations, and upgrades will keep you up to date which is something that most other fish finders can’t do. 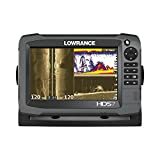 This Lowrance fish finder isn’t for everyone, but it is for those looking for the best option in fishing technology. This HDS-12 GEN3 Insight fishfinder goes well beyond fishing and will become the last fish finder you will ever need. Featuring the best in Lowrance technology including medium and high CHIRP and StructureScan sonar which gives you a clear view of your underwater surroundings. The HDS-12 GEN3 Insight features a brand-new interface. The simple, but intuitive display gives you all the controls where you need it the most while displaying all necessary metrics specifically tailored for anglers and boaters. Outfitted with an internal antenna, side scan and down scan, and even gives you a split screen mode which is much more convenient. 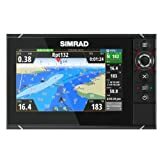 Simrad may not be the biggest name in fishing electronics, but they have become highly regarded after launching this combo unit. The Simrad NSS7 evo2 is a multifunction combo unit which gives you complete control with great viewing metrics for fishing and navigation. The low-profile glass design means more viewing and less borders and is available in four different display sizes including 7, 9, 12, and 16-inches. The Simrad NSS7 features a high brightness display which gives you optimal viewing under any lighting condition. Some of the top features include CHIRP/traditional sonar, multitouch display, StructureScan technology, chartplotter, and the newly released HEROiC software preinstalled. This software has been specifically designed to make the most use of the wide screen, multitouch display making it easier to use, but right in features for the most experienced anglers. This Lowrance fish finder is idea for those who don’t need a transducer as it features a vibrant 5-inch SolarMax LCD screen. Offering rich, vibrant colors which gives a clear view of your underwater surroundings allowing you to locate fish, determine sizes, and see the rest of what’s underneath you. The HDS-5x GEN2 is one of the best-selling 5-inch fishfinders out there which helps it get a 9.6 out of 10 rating. The Lowrance HDS-5x GEN2 fish finder is a high-quality model with an impressive price tag. One of the best bargains in this review which is highlighted by a high-resolution 16-bit display with adjustable backlighting. Viewable under any weather and lighting condition which offers faster displays and reaches greater depths than most. 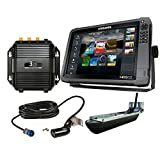 Lowrance HDS-5x GEN2 Fishfinder (No Plotter), with 5-inch LCD. Transducer Not Included. 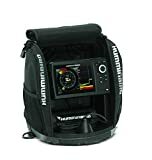 This versatile Humminbird fish finder works with all types of fishing including onshore, offshore, and ice fishing. Boasting a 5-inch LCD display which gives you a crystal-clear view of your underwater surroundings including fish, sizes, depth, structures, and more. Upgraded technology is built right in including UNIMAP cartography and an SD card slot which allows you to save your maps and favorite waypoints for easy access later. The Humminbird ICE Helix 5 sonar GPS fish finder is one of the best in its class which features a vibrant 5” display with 256 colors. 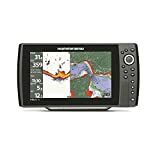 Some of the other features include Dual Beam PLUS Sonar, GPS chartplotting, digital readout, backlight, expandable memory, extreme temperature display, and much more. The HawkEye FT1PXC Fishtrax fish finder is not only one of the best of the year, but it’s rated as the best fish finder under $300. This budget friendly and highly portable fishfinder puts the power right in the palm of your hands in this ergonomic and powerful model which is highlighted by an HD Color Display with VirtuView. The crystal-clear display enables you to see underwater structures, fish, and their sizes helping you take the guesswork out of fishing. The Fishtrax fish finder is one of the best-sellers out there when looking at portable models. Some of the best features include Dual-Frequency FishTrax Intelligent Sonar, depth identifier of fish, and an ice mode digital flasher. If you’re looking for a high-quality fish finder and not wanting to shell out hundreds of dollars, then the Fishtrax may just be the one. 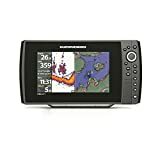 Lowrance has done a lot over the years to help them get to where they are, and its products like this HDS-7 GEN3 Insight fishfinder/chartplotter that puts them in a class of their own. This model isn’t for everyone, but was specifically introduced for those looking to make the most out of their time on the water. Packed with high-end features like medium/high CHIRP along with an SS3D Transducer which puts everything underneath you right in clear view. The Lowrance HDS-7 GEN3 Insight is not a bargain model, but secures your investment for years to come. Everything you would expect from a Lowrance fish finder/chartplotter combo are packed right in including CHIRP medium/high, Insight Mapping, StructureScan 3D Transducer, and multitouch or key pad operation. Lowrance introduced another high-quality fish finder which comes with all-positive consumer reviews and is highly recommended for those looking for a combo unit for both onshore and offshore fishing. The HDS-7 Gen3 model features all the best technology from one of the biggest names in the industry including medium and high CHIRP along with Insight Mapping. CHIRP provides optimal scanning of the underwater surroundings giving users a clear, precise look at what’s underneath the boat. The Lowrance 000-12914-001 includes the StructureScan 3D Transducer which provides a clear picture of everything an angler and boater needs to know. Rocks, weeds, bed, and other structures are highly visible in extreme 3D graphics. The clarity of the picture right on the display takes the guesswork out of fishing and boating allowing you to spend more time doing what you really want to do. Rounding out this review is a Lowrance fish finder/chartplotter combo which has become popular among anglers. This high-quality fishfinder takes fishing to the extreme giving users the ultimate tool to find fish with upgraded technology while mapping out anything under the boat you want to see. Outfitted with medium and high CHIRP technology which continues to innovate the entire industry. Some of the highlight features of the Lowrance HDS-GEN3 Insight is an all-new interface which makes it easier to use and gives you all the control you need. Fully functional controls where the user can choose from a multi-touch interface or touchscreen which works wonders under any boating condition. Insight Mapping and StructureScan 3D technology gives anglers a competitive edge which helps this HDS7-GEN3 model become a top-seller. Feel free to drop us a comment below if you have any other questions, and after you purchase one of the top fish finders this year be sure to come back and tell us all about it.